Eight years ago I was standing on the subway in New York City, leaning on a pole, with eight different boxes of candy taped together, trying to sell it to anyone who would hear me out. If you would have told me that I would have written a book, opened four restaurants, and appeared on national television by now, I would have called you crazy. But why is that crazy? Why do we think that the possible is impossible? I think there are many answers to that question. Our path and the people we surround ourselves with contribute to that for sure. We measure success by the most successful person we know. The only way to change that perspective is by growth and getting out of that comfort zone. Now, I am not saying to just stop what you’re doing and go straight into something with no training. But taking that next step without knowing where it may lead you is key. For example, it might seem odd to write a memoir when you’re not even 30. But when is the right time? 40? 60? The time is whenever you feel that you are ready. Tomorrow is not promised today, so it is important that we explore the opportunities that life offers us. Stories like mine and yours haven’t been told before, because our stories are our own and everyone’s is different. That’s what makes us all special. My restaurant, Kith and Kin, in Washington, DC, is one of a small number of restaurants trying to change that reality. I hope I’m just the first of many chefs of color to get the attention they deserve, and for that reason I want my story to be heard. But the world is changing. People are speaking up. I am speaking up. If it wasn’t for me discovering the joys of food and cooking from my mother at a very early age, turning to gangs when I had nowhere else to go, moving to Nigeria at age 11 to learn hard-won lessons about respect, selling candy bars on the subway to raise capital for my own catering company, or being told by a television producer that I would never be on TV because my skin was too dark and my food wasn’t “Southern” enough — I wouldn’t be where I am today. It hasn’t been an easy path, but any dream worth chasing seldom is. The challenges I’ve been through in finding my place in a world — and specifically in the dining room and the kitchen, where there aren’t enough people who look like me — are real. This is a story that I hope will inspire others to reach for their dreams no matter what stands in the way. My story isn’t about going from rags to riches. There were, and continue to be, obstacles and missteps along the way. My first restaurant, which I spent years working towards, shut after just a few months. I was devastated, but it was an opportunity. An opportunity for change and growth, once again. If real change begins with awareness and a deep understanding of the issues at hand, I hope that my personal journey will shed new light and add a human dimension to ongoing national conversations about race and restaurant culture. It is undeniable that cooking in professional kitchens is tough — we’ve all read and heard about young cooks being screamed at and even physically abused in kitchens. It has almost been like a badge of honor for chefs to recount what they went through and how they toughed it out “coming up” in kitchens. I find no honor in that. Hell, I’m sick of hearing about it. It’s an abomination. Try existing in that atmosphere as a minority. In the hostile environment of a kitchen where curse words are the norm and intimidation is expected, racist nuances are often overlooked or ignored. There is no room for complaining unless you are looking to either be fired or forced to quit. Another chef once told me I was black, but not like other black people — I was smart, I was sophisticated. I guess he figured I would be beaming with pride after that statement. My words, actions, and abilities are always judged with my race in mind. I have been a firsthand witness. In that same restaurant, the dining room manager later told me that my “thuggy” attitude wasn’t going to get me anywhere in life. Go figure. But the world is changing. People are speaking up. I am speaking up. I will continue to speak up. There are countless stories of adversity people have faced while working their way through this industry, and for most, that pressure is inhibiting. But for me, the insults, the attitudes, and the racism have stoked my drive. In keeping myself moving forward, I have never thought of myself as a black man aspiring to become a chef. I am a man chasing a dream, many dreams, who is not going to let anything or anyone get in my way. I do not want to be known as a great black chef, I just want to be a great chef. And I want to help others be great. Everybody. So what do you want to be known for? Myself, I want to make a difference. I want to change the way fine dining is experienced and perceived, from the point of view of the diners, the cooks, the servers, and the dishwashers, all the way to the community around restaurants. My hope for Notes From a Young Black Chef is that it helps move us all a step closer to that goal and inspires you to find greatness in your story. Change is uncomfortable, but change leads to growth. Kwame Onwuachi is the executive chef at Kith and Kin and owner of the Philly Wing Fry franchise in Washington, DC. He was born on Long Island and raised in New York City, Nigeria, and Louisiana. Onwuachi was first exposed to cooking by his mother, in the family’s modest Bronx apartment, and he took that spark of passion and turned it into a career. From toiling in the bowels of oil cleanup ships to working at some of the best restaurants in the world, he has seen and lived his fair share of diversity. Onwuachi trained at the Culinary Institute of America and has opened five restaurants before turning 30. A former Top Chef contestant, he has been named a 30 Under 30 honoree by both Zagat and Forbes. 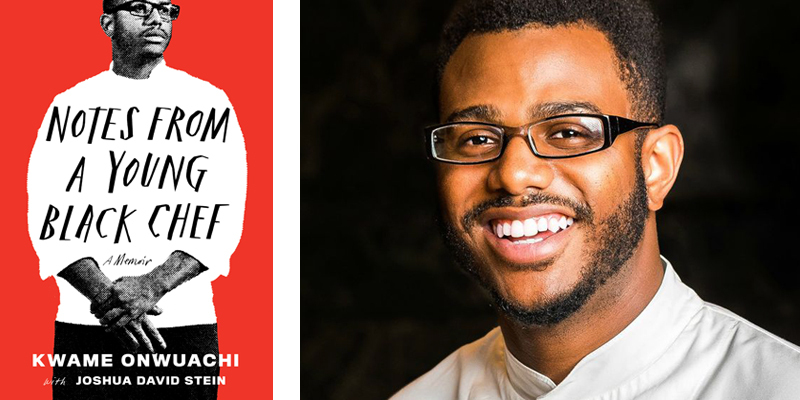 Notes From a Young Black Chef is his first book.